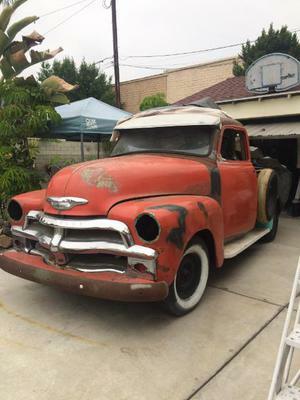 6/14/2015 West Covina, California - 5 window cab, with rare original automatic trans/235 6 cylinder. Accessories include: original radio and heater, sun visor, artillery rims, spare tire mount, spot and fog lights, front grill guard, CA commercial black/yellow license plates, hood bird, chrome window frames, manuals and lots of extra parts. Truck has slight rust, not running, partial restoration. Contact Manny Hernandez on (626) 814-2913.